Restaurant hunting is a risky business. If you're lucky you end up with a full belly and a smile on your face, if not you could end up hungry and miserable or even worse. 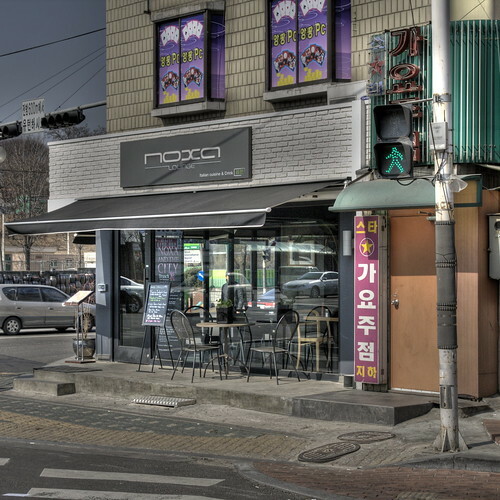 I had a very lucky escape this weekend when I decided to try the Noxa lounge in Noksapyeong. Service was friendly and the food came out quickly, but as the plate touched the table and I bent my head down to savour the aroma of basil and pine nuts I got a whiff of something altogether unexpected. Before I continue I just want to state that the following description of the food is my opinion and mine alone, perhaps my olfactory senses are off, perhaps I was having a bad day, perhaps there are taste sensations with which I am unfamiliar. For all I know the smells and flavours presented to me at Noxa are par for the course, but this pesto smelt like no other I have known. Have you ever done the washing up and left a plate, bowl or cup with a little water in it and stacked it with the others? If you have you may recall that said piece of crockery can develop a sour unpleasant smell that screams "UNCLEAN! UNCLEAN! UNCLEAN!" as it wafts through your nostrils. 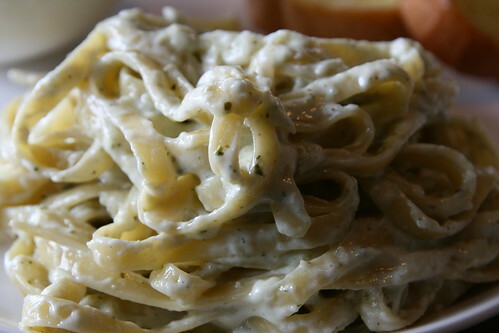 The smell coming from my pesto cream pasta was just a little bit similar to that. The taste... slightly worse. I didn't taste pesto, just something unrecognisable and the smell kept on cutting through any other flavour sensation. The waiter came over and asked if anything was wrong and I tried to explain to him that there was some strange smell coming from my food, he brought over the chef who (without smelling the dish herself) tried to explain the cause of it. She thought it was the garlic or perhaps the strong smell of parmesan cheese. I said that I was perfectly at home to both those fragrances and that it was some other smell that was getting to me. The chef then explained that she crushes the garlic in advance and that the taste changes over time. 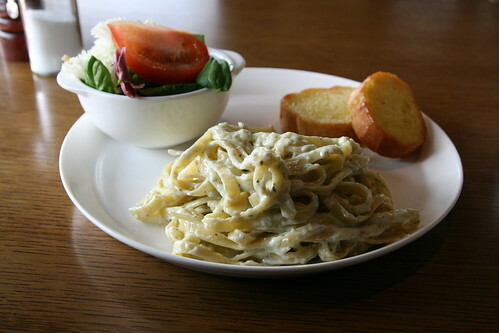 The garlic in my meal had been crushed three days before and so the flavour and scent had developed. In all fairness the chef offered to make me a different dish, but I just couldn't stomach it. I've never had garlic that smelt like that and I had no wish to sample any other dishes. Maybe it is my taste buds, maybe I'm a freshly crushed garlic snob, whatever the case I didn't want to hang around. I made my excuses and left. Mao! 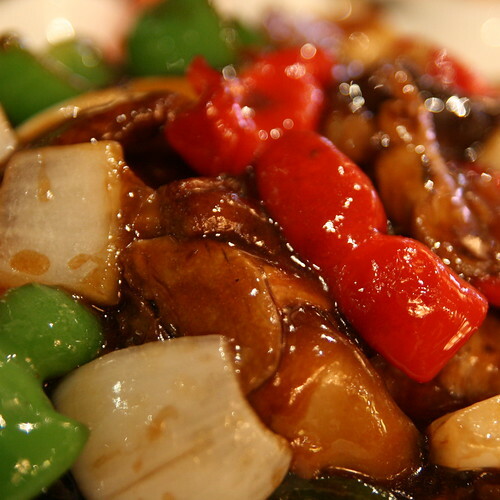 Chinese food, comforting and simple, was the remedy I needed. I ventured inside and was shocked by how beautiful the restaurant is. I didn't want to spoil other people's lunches by taking pictures of them, so my few snaps don't do justice to how gorgeous Mao looks. Dark wooden shelves and jars of colourful herbs give great character to the place and the dark reds and greens on the walls bring a sense of comfort and luxury. 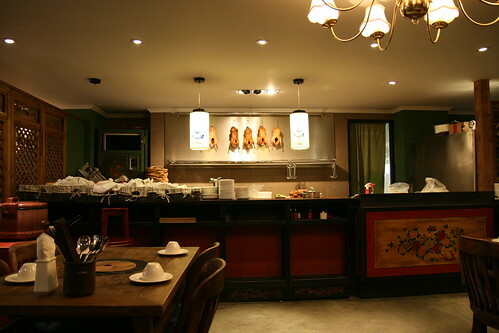 The semi-open kitchen with its hanging poultry made me fall in love with the restaurant in no time at all. As I was eating by myself I skipped past the more expensive items and went straight for the rice/noodle menu. The usual suspects, fried rice and black bean noodles were there (5,000 to 10,000 won) along with a rather interesting little dish: Duck Fried Rice with Abalone Sauce (10,000 won). I adore duck and rarely get a chance to eat it in Korea, so I knew exactly what I wanted. 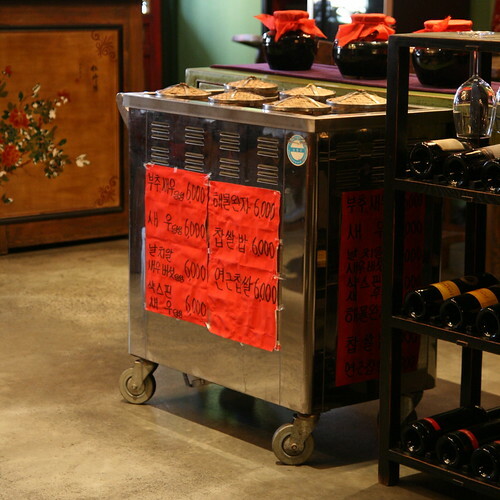 I also spied this cute little dimsum cart, with seven different options. 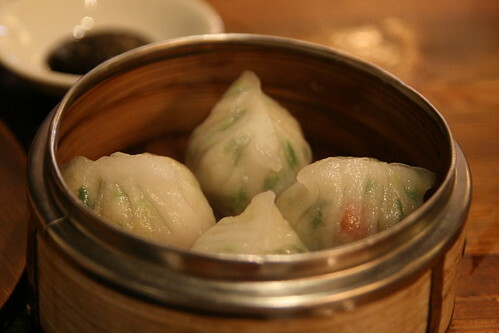 I went for the garlic chive and prawn dumplings (6,000 won). The duck arrived first and was divine. A very generous portion of meat with some skin, mixed with red and green peppers, thick slices of oak mushroom and large chunks of onion. The rice was not fried, just boiled and sat hidden under the sticky brown layer of duck. From the very first bite I was in duck heaven, everything was cooked to perfection and the strong flavour of the duck mixed well with the deliciously unctuous abalone sauce. The flavours took me back to my days as a student in London, when I would head to the back streets of Leicester Square and fill up on cold duck, bok-choi and boiled rice. Real nostalgic comfort food. 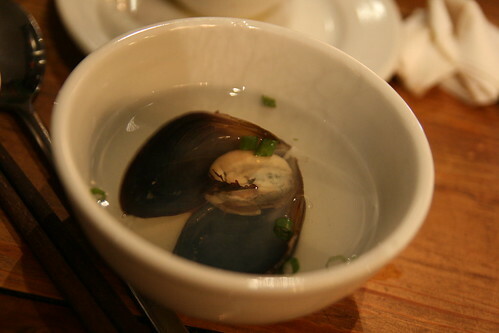 The dish was served with a seafood broth containing a solitary mussel, good for cutting through the fattiness of the duck. The dumplings arrived soon after the duck, they were incredibly sticky and very delicious. 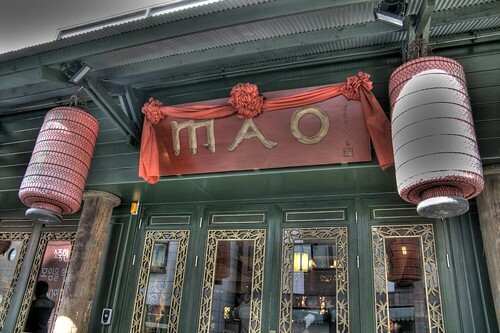 After my first aborted attempt at lunch, Mao was a godsend. 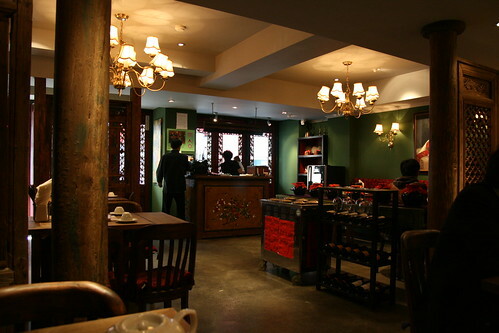 Good service, excellent food and a very pleasant atmosphere. I'm excited to go back and try their Beijing Duck and cold honey-roast pork. Definitely worth the hike up the hill. 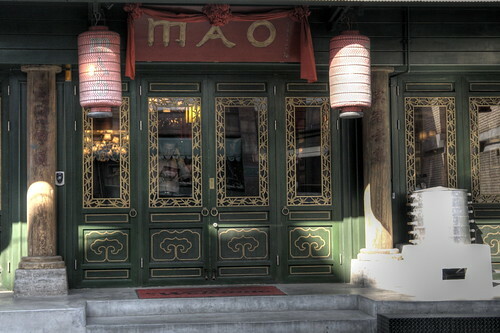 Mao is about 300 metres down the hill from the Grand Hyatt Hotel and is opposite the Sri Lankan embassy. Call them on 02 793 8845. One of the things that makes me sad about living out here in the countryside (I live across the street from rice paddies) is the lack of good restaurants of any kind. I come from a foodie family, and it's downright depressing out here sometimes. Thanks for the add. I really enjoyed your story about Korean hospitality. Sorry to hear that you're stuck in the middle of nowhere. I hope you get more chances to come to some of the bigger cities and try some delicious dishes. 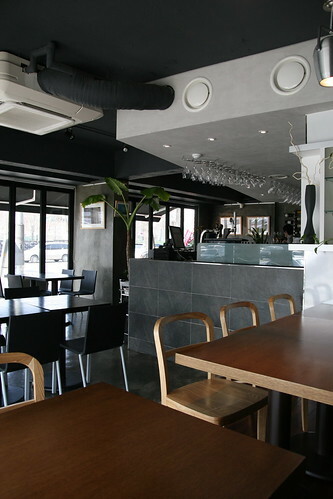 If it's any consolation I know some good restaurants in Gwangju. I'll hopefully be blogging about them this week. I'm glad you enjoyed the story. I felt I should contribute something positive to the often overwhelmingly negative Korean blogosphere. Oh, I like my location, I just occasionally get frustrated with the fact that I have to go to at least Mokpo, and generally Gwangju, to get most things. I like the peace and quiet here, but I'm not sure it was worth the trade off. I'm going to Gwangju this weekend, so I would love some recommendations! 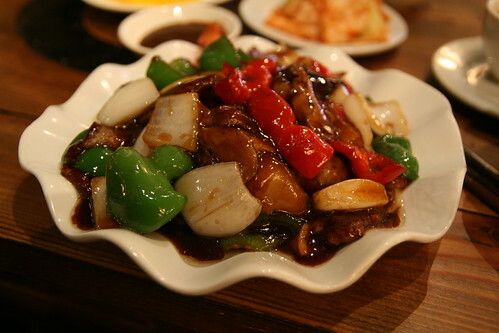 My favourite place to go in Gwangju is the 떡갈비 (Ddeok Galbi) street in Gwangsan near the 송정리 (Songjeong-ri) KTX/subway station. It's just five minutes walk away and you can get the most delicious charcoal grilled minced meat patties. Sort of the traditional Korean answer to the hamburger. I'll see if I can put up my post before the weekend with some detailed directions and photos. heh. I looked at the decor of that first restaurant and knew what would happen. it sometimes seems to me that the more modern and stylish the interior of a restaurant is, the more likely it's serving overpriced dreck. sure, I'm probably wrong sometimes...sometimes. I know what you mean Roboseyo, I always have a sense of foreboding when I enter somewhere that seems to be trying just that little bit too hard. the thing that amazes me is how often people on the street, and even restaurant reviewers, seem to get hypnotized by the shiny, stylish decor, and never notice that the food's rubbish.